With both a new moon and the Spring Equinox last week we’ve been feeling the stirrings of change. The Spring Equinox is when night and day are exactly the same length, and marks the beginning of longer days and warmer months ahead. Buds are forming on the trees and seedlings are sprouting from the earth as the soil warms up. It’s a time of releasing anything holding you back and embracing the new. 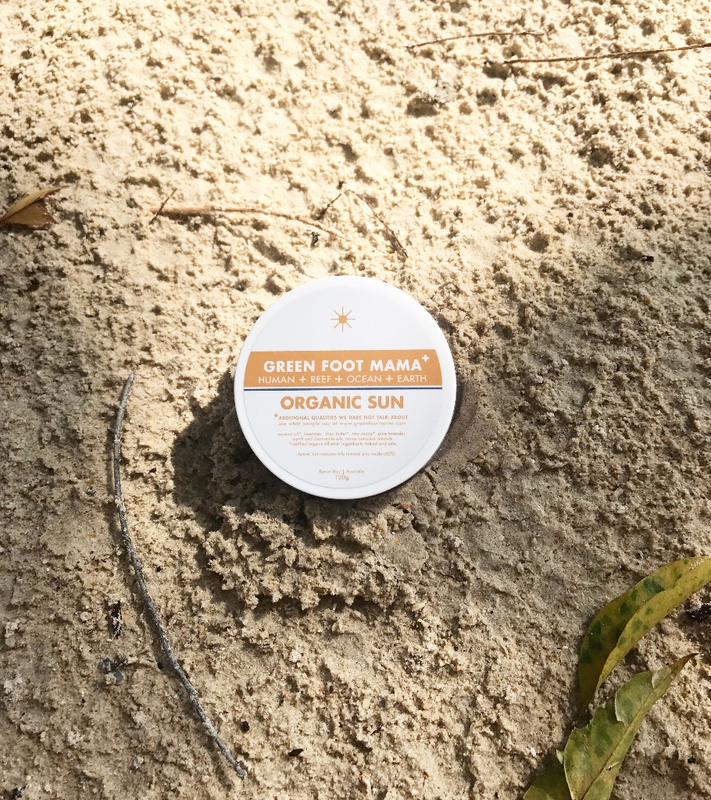 For Green Foot Mama, these energies have seen a refreshed look and some changes on the website, including the ability to leave reviews. Just go to the page of your favourite balm – Sun, Skin, Defence, Jetset – and click on the stars or ‘write a review‘ link under the product name. 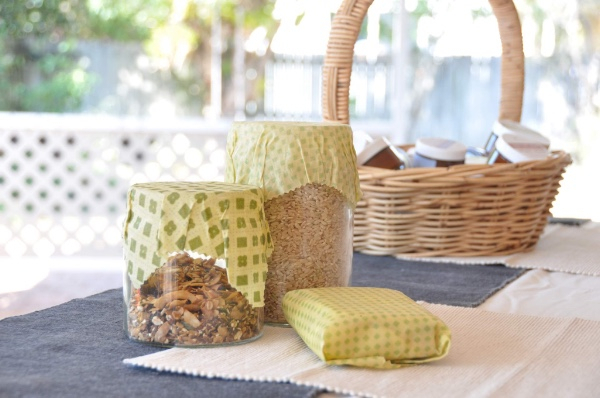 I like to minimise waste where I can – and plastic wrap has got to be the definition of single use plastic. In honour of plastic-free July I decided to have a go at making my own eco-friendly re-useable beeswax wraps. A quick google search found a number of tutorials and two different methods. I tried both methods to see which I liked the most. We’ve now been using the wraps I made for a couple of months – I don’t know how we ever lived without them. Learn more about beeswax wraps, and how you can make your own, on the blog. We met some lovely new people and answered LOTS of questions about Green Foot Mama at our very first market stall last Sunday. 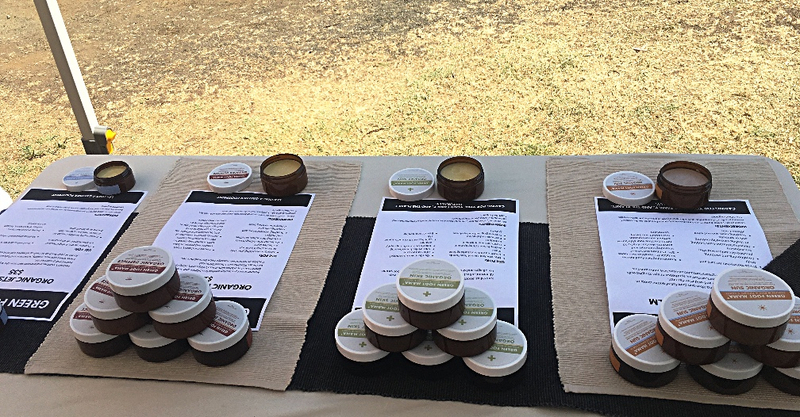 It was a super-hot and windy day – we thought we might blow away – but lots of people came out to enjoy their day at The Bangalow Showgrounds. We’re looking forward to doing other local markets over the summer. I love talking to people and finding out about their skin issues and concerns. We were fortunate to be part of the amazing gift box for the guests of One Hot Retreat in Malaysia this month. 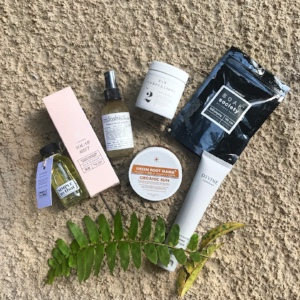 So grateful to be in such great company with other great Australian natural brands such as Simple as That, Soak Society and Rasasara Skin Food. We’ve had a lot of activity on our facebook page recently. Would you use an edible water bottle? Do you need some tips to help your children develop eco-awareness or pack a healthy, more sustainable lunchbox? Also fashion from fabric scraps and recycled water bottles, a roundup of 12 ethical shoe brands and will you keep buying Pukka Tea? Join the conversation by liking or following us on facebook. A collaboration with the gorgeous Mama Maya organic swaddling wraps – giving more mamas in developing countries access to a safer birth. Now that the weather is warming up, it’s a good time to be thinking about sun protection. Your VIP BONUS this time is a free Sun or Skin 20g mini included with every order until the end of October. Pop your preference in the order notes and don’t forget to use your VIP BONUS code XXXXXX at checkout.